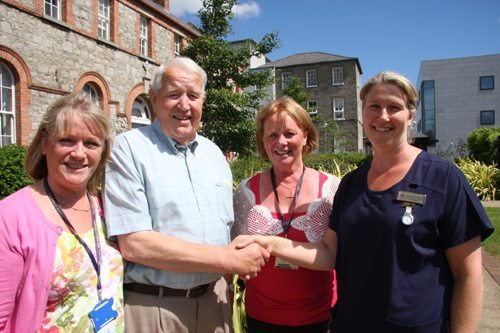 Paddy Doolin has presented a cheque for €3,800 to St. James’s Hospital. The donation represents funds raised at a night of glorious music and song held at O’Dwyer’s Pub in Dunboyne at which the Dublin City Ramblers, Railway Paddy and The Freddy O’Connor Trio performed to a rapturous applause. All services and prizes in connection with the event were donated most generously by friends and local businesses and Paddy Doolin was most grateful to all those who helped. He said: “No one said no to helping us and to helping St. James’s”. He continued: “I was particularly grateful to my daughter-in-law Anne (Moore above) who works in St. James’s and her colleague Siobhán (Harrison above) who helped so much with the arrangements.” He dedicated the funds given to the cancer service at St. James’s. Raffle prizes were donated most generously by friends and local businesses that included Carton Golf Club, Westmanstown Golf Club, Palmerston Golf Club, Luttrelstown Golf Club, Declan Killeen (Mo) Compere for the night, Henry Carthy, Jack Brady – Waterford Glass, The Hatchet Pub, St Marys GAA Club, Leixlip, Bernard Owen Menswear, Leixlip, Eurospar, Barnhall, Leixlip, Carraig Flowers, Leixlip, Springfield Hotel, Leixlip, The Salon Hairdressers, Barnhall, Leixlip and Declan Keaveney. St. James’s is the largest single provider of cancer treatment inIrelandand is the largest national centre for radiotherapy service. A major new government funded Cancer Care Centre and Radiation Oncology Centre is now open on the site and a facility for PET imaging for advanced patient diagnosis is open – the first such facility within a public hospital in Ireland.